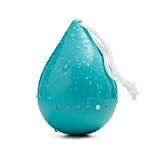 The cool new Zumreed Drop is a water-resistant Bluetooth speaker / speakerphone shaped like a little water drop that can be hung from it's included strap. Its splash-proof design and portability make it perfect for listening to music in the shower, by the pool, on the beach, in the rain, or wherever you won't be completely submerged. It not only syncs to your smartphone via wireless Bluetooth to play music, it also has a built-in microphone so it can be used as a speakerphone as well. It also features 10 hours of continuous play on a full charge, powerful 3W audio output, and 5 push button controls.